The freestanding saddle stand is stylish and provides practical storage to showcase a prized trophy saddle in a display room, living room or tack room. 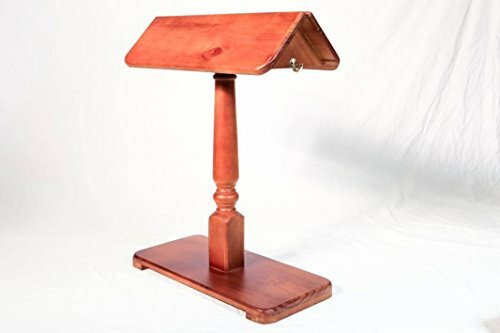 This saddle stand has an angular top to properly support the saddle tree and helps the saddle maintain its proper shape. The rack is fitted with double hooks on either side to hang related tack such as bridles, halters and cinches. The saddle stand is supported on a wide base that provides stability. The wooden saddle stand is handmade in Melbourne, Australia from solid Radiata pine and is protected with multiple coats of lacquer which means it is hard-wearing, robust and easy to clean. We offer the stand in a choice of 6 stains (Clear, Baltic, Dark Baltic, Walnut, Mahogany and Wenge) and 2 painted finishes (White and Black). * The featured saddle stand is in the Baltic finish. If you have any questions about this product by Fabian Woodworks, contact us by completing and submitting the form below. If you are looking for a specif part number, please include it with your message.